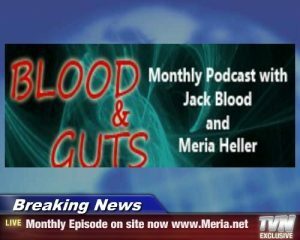 4/19/16 Blood and Guts with Meria and Jack Blood.Jack’s 20 yr radio career;the Boston Marathon-same day as extortion day;unanswered questions abound;19th-day of Waco and Oklahoma bombings – Clinton’s murdered children;staged events;setting up an event;crisis actors/drills;Craft International;Bin Laden-Ted OSSman;weather manipulation and warfare;sociopaths;Clinton/Trump;Hegelian dialect;WTC 1993;stolen elections;McAfee & Jill Stein;Kasich;Democratic spring? Panama papers -who and why;28 pages on the 9/11 Omissions report;Graham had prior knowledge, did nothing;Trump and Epstein;anti gay bills;and much more. Your discussion in this show sparked a lot of ideas in my head for how to be a heretic without actually having to put my very life on the line in a mass protest. The most important tips are still be informed and stay bold.